Dallas Police Department Fusion Center with Chistie MicroTiles Video and collaborations technologies have hit their stride. They have transitioned from a niche appliance to an integrated IT application and have become nothing short of a pervasive user service. It truly is no longer the next big thing; it is now The Big Thing. This reality is driving rapid growth and accelerating technology advancements with new announcements to further develop capabilities. Anyone in this industry can attest that these advancements are seemingly being released weekly. The reality, however, is that the “consumerization” of video has begun to significantly outpace many service provider capabilities, leaving organizations without key support in critical areas. The price of advancement is high for those whose value proposition is dependent on their ability to keep pace. For many providers, the leap to develop the extensive IT capabilities now needed to compete is simply more than they can bear. Although these new requirements for relevance within the marketplace ultimately will drive vastly improved service offers, times of transition bring with them risk — and potential pain for technology adopters. Many have not yet seen the problem; the interesting thing about complexity is it tends to hide underneath the veil of its own creation. Unfortunately, most often it is not readily apparent until it is unavoidable. Let’s say you want to deploy integrated AV rooms. No problem. How about some video-enabled conference rooms with a bridge or a cloud offer to support your multipoint meetings? No sweat. The reality, however, is that these examples are yesterday’s environment and use case scenario. Let’s bring the technology forward to make it more relevant and better understand the nature of today’s challenges. How about deploying a virtualized, distributed infrastructure environment with integration to corporate directory services linking your AV and legacy meeting rooms, the ability to support your desktop and remote strategy while supporting deployment requirements around network architecture, database integration, and the ability to support or augment your bridging requirements with a cloud offer? Thinking perhaps that is an extreme example? If you are, think again. If video and collaborations have shown us nothing else through their evolution, we have been shown that the appetite for the technology will not be satisfied until it is fully ubiquitous, continuously available and easy to use. The reality is that your organizational communications roadmap will soon look like the above if it hasn’t already begun to make the transition. As you determine your strategy and set out to identify your implementation partner, if you are expecting a single source provider, block out some time and grab some aspirin because it’s going to be a challenging search. To successfully deploy the aforementioned requires the capabilities of multiple disciplines — many of which have not typically been found within the same service provider organizations. This makes successful implementation a challenge. 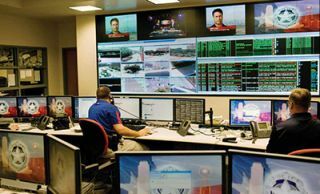 Mission Control Center of the NASA Johnson Space Center Source Service and solution providers, AV integrators, VARs, and conferencing companies have entered a new arena in which they must defend and redefine their relevancy. Most simply cannot support the multi-disciplined proficiency required to be competitive in today’s expansively integrated environments. Historically, to deploy a video environment required that you had access to a video infrastructure engineer who understood networks, both IP and ISDN. They would understand your gatekeeper registration requirements or your SIP proxy and trunk needs and would be able to establish media gateways to allow the various protocols to communicate. Today, however, you will also need expertise within Microsoft to support your Lync integration, a wireless network specialist to enable your BYOD policy to be effective for mobile video, expertise within LDAP or Active Directory for your distributed directory services, database support able to assist with SQL and MySQL, knowledge with server operating systems ranging from Windows Server, Unix to Linux, and virtualization expertise with applications such as VM Ware and Hyper-V. Note with the above there was no mention of the rapidly advancing technologies specific to video around H.264SVC, H.265, VP8, VP9, and of course, the recent contender to hardware and software based endpoints, WebRTC. Video and collaborations media today traverse technology nearly as much as it is a technology in itself. This reality makes make this communications solution quite possibly the most challenging IT application and consumer the enterprise has ever experienced. Some may dispute such a claim. However, I would look for another example of an application or technology that is as integrated within the IT environment with communications needs that are real time, bursty with traffic in the core of the business day, exceptionally low tolerance for anything but an optimized network environment and with the extensive executive visibility of video. Does technology exist to complicate or to simplify? While the answer is obvious, given all of these scenarios, it certainly brings into question if technology is — in fact — meeting its core charter to simplify the lives of its users. The reality is that technology is, and will always have, extensive complexities that need to be managed. This fundamental reality sits at the heart of what provides an enduring need for genuine “solution providers,” as product manufactures cannot adequately solve the challenges that exist within homogeneous environments. Therefore, video service providers today have a tremendous opportunity and I would even suggest an obligation to reevaluate the value they bring to the marketplace. Not only must they be able to design and deploy deeply integrated technologies, service providers must develop a set of solutions that are consumable and distance end users from the undercurrent of complexity. Simple is actually quite difficult — particularly when the underlying technology is extremely complex and it is utilized by a wide array of applications and users. Simplification of the offer must not be contained solely to the technology used, but also everything else around the technology — from the maintenance and managed service support, to the service definitions and commercial terms. Enterprises rightly look to video and collaborations technologies to advance their organizational effectiveness with solutions available in boundless and often intimidating quantities. Success requires clarity in the business need, with an eye to the roadmap strategy to ensure it supports future development requirements. While only a limited number of service providers can support the breadth of today’s extensively integrated video environments, many will have polished service propositions that may well appear to meet your needs. Before making your partner selection, remember that a successful deployment within your organization will require a highly reliable solution which can only be achieved with proactive and persistent system administration, monitoring and management across the extended IT environment, not just within “video”. Make certain that any IT support gaps that exist within your internal IT organization are augmented by a comprehensive managed service. Ensure also that you are honest with yourself regarding the technologies that are within your competency to proactively support well. Often times, even if the capability exists internally, the time available to devote to the needed preventative maintenance activities is difficult to come by. Understand that for mission critical applications, reactive-only support has very little value; up time is paramount and that requires proactive management. For many business, both SMB (small to medium business) and MNB (multi-national business), there is value in leveraging a partner to support the chore so you can focus on your core. Today’s collaborations technologies are nothing short of transformative. They enable faster responses to changing market demands, keep organizations closer to their customers and partners, and enable geographically distributed teams to work seamlessly together, all while delivering cost savings. Each of these benefits is built right in to the technology; they propel your business forward—when they work reliably. Ensure that you have absolute clarity on requirements, and work closely with prospective service providers and integrators; this will ensure they truly are the right partner to support your needs. Bill Thompson is a contributor to AV Technology magazine and the VP of video services with Carousel Industries.